The guy who got 700,000th is the guy who informed me the 400,000th site I was waiting for was long made before. Enjoy your cookie, and your piss was well earned. i'll make sure to delete all 3 of mine right now. wtf? thats nuts, have a cookie. Well my good sir, thats all of your YTMNDs 5/5'd Congrats, you earned them. Nice...not only is it the 700,000th, but its actually good too ^_^. ITS OVER NINE THOUSAND!! Sorry, couldn't resist. rowid 700000 might not be the 700000th site made. Lower vote due to "it's" instead of "its". "it's" is a contraction of "it is". "its" is a possessive pronoun. 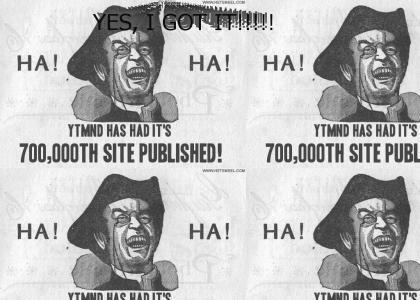 Examples: "YTMND has had its 700,000th site published." "People are downvoting it because it's stupid". Do you see the difference between the usage of "it's" and "its"?